Made of the same puncture-and-tear resistant polypropylene as our standard bags, but with a longer length and a smaller width. Filled size is about 4" high, 8" wide & 24" long. 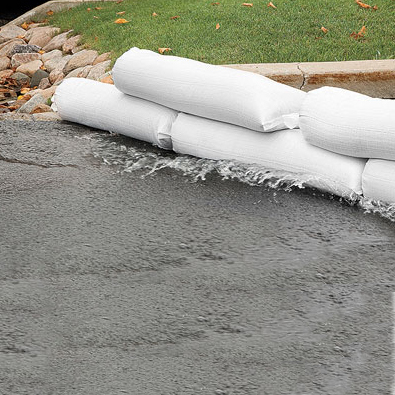 Perfect for flood control or ballast in the bed of your pickup. Each bag will hold up to about 60 lbs when filled, depending on what kind of fill material you use. These come with tie cords. These are treated with 1600 hour UVI. Online purchases sold in lots of 10. We also sell these tube bags filled for $5.00 each locally. If you're looking for something similar but much more permanent, check out our snake bags.